National Pie Month has been, in many ways, an amazing challenge. It’s challenged me to make and edit essentially the same photograph over and over. It’s challenged me to experiment with new ingredients, new techniques, new flavors. I’ve loved every delicious minute of it. Not to mention that I am now able to make amazing custards almost effortlessly. 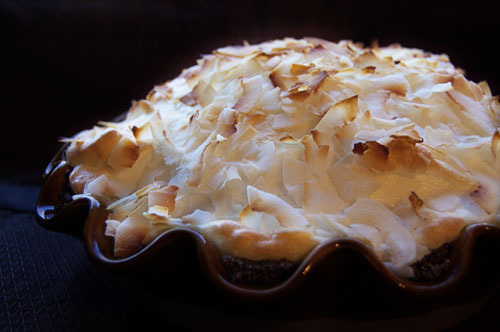 For my final sweet pie of the month I made a coconut cream pie, the request of a reader. I was dubious because I’m not a huge coconut fan, nor am I a huge custard fan. I knew I’d want something different, something to add a twist to the overall flavor of the pie. So I decided to add a chocolate creme/graham cracker crust. It was a great decision. It added a layer of flavor to the pie that was so different from, yet perfectly complimented, the custard and the meringue. It was the perfect way to end this month o’ pie (sweetly). Heat milk in a medium saucepan. Bring close to a boil. In another bowl, combine sugar and cornstarch. In a third bowl, whisk egg yolks. When milk is hot, spoon 1 ladle-full into the eggs. Whisk together. Return egg/milk mixture to the milk and stir. Slowly stir in the sugar and cornstarch. Stir until it thickens. Cut the heat and add butter and vanilla extract. Combine oreos, graham crackers, and sugar in a food processor. Blend until crumbs. Melt butter. 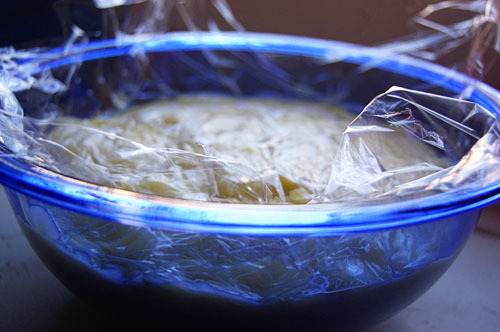 Toss butter and crumbs together, press into pie dish. Bake at 350 for 10 minutes. Scoop custard into pie dish. Whip egg whites, cream of tartar, and sugar until stiff. Fold over custard, making sure to seal the edges of the meringue to the pie dish. 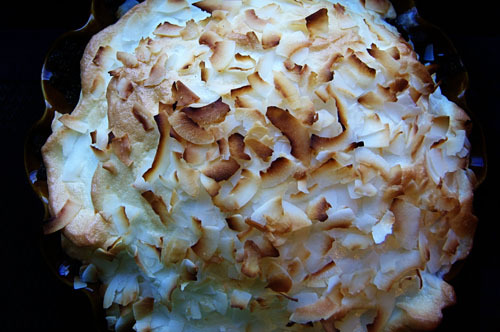 Top with coconut. Bake at 350 for 5-7 minutes, or until golden brown.